The legend of Vlad the Impaler is the stuff of nightmares. The inspiration for the most iconic of monsters – Dracula – Vlad tortured and murdered thousands of victims. But what turned him into such a depraved killer? The truth lies in his teenage years, when Vlad and his brother Radu were held hostage by the Ottoman Empire. During this time, the brothers learned many things: archery, riding, the art of combat, matters of court … and how to stalk and slay vampires! From writer Cullen Bunn (Dark Ark, Unholy Grail, X-Men Blue, Deadpool, Venom) and artist Mirko Colak (Unholy Grail, The Punisher) comes a tale of brothers and blood. DF sat down with scribe Cullen Bunn to learn more. Dynamic Forces: Cullen, besides some flashbacks in Marv Wolfman’s brilliant Tomb of Dracula for Marvel, this is the first look-see at any iteration of a young Vlad I have ever encountered. From where did the inspiration for this one come? Cullen Bunn: I drew inspiration from many sources, I’d say. From Stoker’s brilliant novel. From Tomb of Dracula, maybe, though I don’t remember the flashback scenes, and I guess I better check those out. From old Hammer movies. But, to give credit where credit is due, the Frog Brothers in the movie Lost Boys might have been seeds for the story I’m telling here. The Brothers Dracul have little in common with the Frog boys, but I do love the idea of a pair of teenage brothers fighting the forces of darkness. After we wrapped Unholy Grail, Mirko and I exchanged some emails about what to do next. He sent me a very quick message that read something like “how about something with Dracula?” and I immediately put the pitch for this story together. DF: We know Drac was based on Vlad and that he was indeed a living person. Was there a “real” counterpart for Radu? Cullen Bunn: Oh, yes. Radu was one of Vlad’s two brothers, and the two were held hostage by the Ottoman Empire, as they are in this comic. Radu was said to be very handsome—almost angelic. Of course, the “real” history of the world left out that the pair were trained vampire killers. DF: Before we tackle the AfterShock book proper, can you give us any indication of what type of research you and/or artist Mirko Colak did to create the world we will see in Brothers Dracul? Cullen Bunn: History is a bit vague when it comes to Vlad and his brother, but I dug into as much of it as I could, and I scrounged up many, many images to help Mirko nail the look and feel of the story. Then, Mirko—who is a huge fan of the stories of Dracula—did a ton of research on his own. In fact, I believe it is safe to say he was researching this book long before we ever pitched it. DF: This occurs during the childhood of Vlad Dracul in the mid-1400s. Give us just the briefest of backgrounds, if you will, on Vlad’s father and the status of the Ottoman Empire at the time. Cullen Bunn: Well, Vlad Dracul, the father of Vlad and Radu, has upset the Ottoman Empire. He’s been disobedient, and that simply will not do. As this story begins, we see that Vlad, Young Vlad, and Radu have been taken prisoner. While Vlad Dracul swears fealty to the Ottomans and is released, his sons are held prisoner to make sure their father plays nicely. DF: Will we see anything of Vlad’s eldest brother, Mircea? Cullen Bunn: Not initially, although Mircrea is mentioned and his presence (or lack thereof) is felt. DF: Give us your interpretation of your characters, Vlad and Radu Dracul. Cullen Bunn: Radu is an innocent, a gentle soul, as beautiful on the inside as he is on the outside. His brother, though, is cold and angry, brooding in contempt over being imprisoned by the Ottomans. While Radu is level-headed, Vlad is a seething ball of rage, and he’s always looking for some way to get his revenge. DF: Who will be the key big-bad in this tale of kidnapping and torture? Cullen Bunn: Well, there are vampires aplenty! And these aren’t the suave, sophisticated vampires you might be expecting. They are awful and hideous and brutal and monstrous. There’s a big bad coming along, too, but that is something I don’t want to reveal just yet. DF: Talk about the art of Mirko Colak. Cullen Bunn: Mirko is an amazing talent, especially when dealing with the darker side of history. While I’ve worked with him a few times, most recently on Unholy Grail, and I’ve always been impressed by his work, this book is without a doubt his strongest artwork to date. His love for the subject matter is evident. DF: Cullen, what new is coming from that kinetic keyboard of yours? Cullen Bunn: Lots of new creator-owned books coming in the near future. Nothing I can announce just yet, but I’m very excited about the stories I’ll be bringing you very soon! I’m even cooking up something new—and dark and horrifying—with AfterShock at this very moment! Dynamic Forces would like to thank Cullen Bunn for taking time out of his busy schedule to answer our questions. 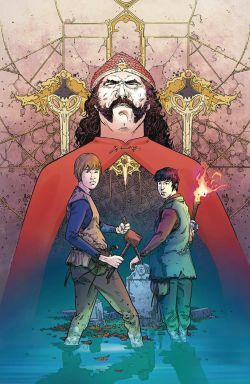 Brothers Dracul #1 from AfterShock hits stores April 11th!